It is not really notable to point out that the editorial board of the New York Times has strong biases that influence not only its opinion pieces, but also its allegedly neutral news department. This is self-evident when it comes to almost anything they cover on the U.S. domestic front, whether political, economic or social. 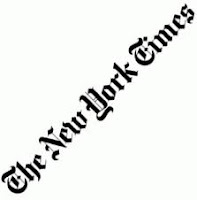 Less noticed, at least to a wide spectrum of disinterested Americans, is the bias of the New York Times on foreign policy coverage, which unfortunately is of disproportionate influence to the ignoramuses in government in Washington, whose interaction with the world is limited by language, culture, experience and basic intellect. When it has come to the arrival of the "Arab Spring" in Egypt, the New York Times from the outset decided to portray the happenings as a revolution a la 1776, 1789 and Eastern Europe circa. 1989, conveniently overlooking the near complete absence of evidence of this being true. Facebook and Twitter messages from a handful of self-declared, English speaking "activists" became the barometer for the emotions of 85 million Egyptians. Islamist retrogrades were recast as enlightened and free-thinking. Unionist failures have been somehow elevated as vanguards of the Left against "the Establishment." Two of the losing candidates (one an unapologetic believer in the same Nasser who dragged Egypt and the region into successive, catastrophic wars and decimated the country internally, the other a dyed-and-stained Islamist, but whose beard is better trimmed than his colleagues'), are "moderates" who really reflect the will of majority, because, together, they won more votes than the winning candidates (right, and the World Cup should be retroactively decided by the winner of the match between losing semi-finalists). Fault for the losing candidates losing (though they really won, but didn't) can be attributed to state-controlled media "fomenting animosity against pro-democracy activities" (as opposed to obediently taking the "rah-rah revolution" line of more neutral "news" outlets like the venerable Times). The Obama administration should be using its "limited leverage" (who knew how little tens of billions in direct and indirect aid, and decades of dominating political, economic and cultural influence from the world's sole superpower to a dependent ally could get you) to "make clear" to the remaining Islamist presidential candidate that "it will work with him and the Brotherhood - so long as they respect the rights of all Egyptians" (sure, and no need to dwell on the details of the violent religious and social wars sponsored by the Brotherhood, we'll just take them at their word and all be friends). All of this is superficial, naive and dangerously misleading. President Obama, America, world: please do not get your views of Egypt from the New York Times.